Look here for all kinds of design drawings for it. 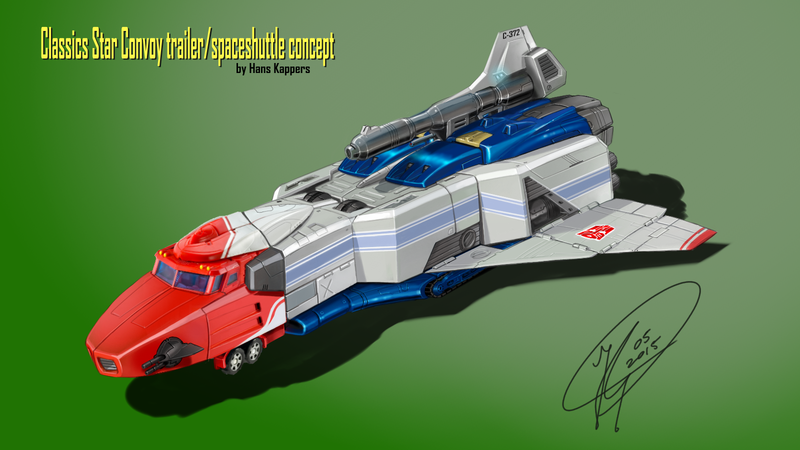 Today I finally finished one of the early concept sketches of the toy: the spaceship mode of the trailer. Classics Optimus Prime is the cab I imagined would tow this little thing around and combine with it to form a trailer. That's not all though. It should also be able to combine with a redesign of Sky Garry and a retooling/repaint of Armada Tidal Wave in the colours of Grandus. Oh and Roller / HiQ. This has been in the back of my brain for too long, so I had to get it out. Decided to make it prettier than just a rough sketch so I could use it for my design portfolio too. Star Convoy (c) TakaraTomy and Classics Optimus Prime (c) Hasbro. So. Would you buy this? Must say having the Truck & Spaceship mode.... kinda like a more badass Octane, definately makes the name Star Convoy carry extra weight. This looks absolutely wonderful! Please make this official! So, Classics Optimus is still in there intact, only his new "trailer", sorta surrounds the cab and connect behind him? I think toy cillectors would love it, Classics Optimus is a very popular mold, and this would be an exciting new trailer/armor idea for him. Of course there would be a regular trailer (akin to the old one) and a base mode too. Wanna help me think it out further? xD Still need to work out base mode, trailer mode and combined super-starship (with Sky Garry and Grandus (Armada Tidal Wave) and super robot combiner mode. >.<"
(See link in description for simple combined Battlestar Convoy sketch, working on a first draft of the full combiner mode now). Maybe Roller could connect under it, as part of the landing gear, kinda like the Armada Jetfire minicon, only in the rear part this time. That's the general idea yeah. I'd buy, unless it was priced like a Third Party figure. Sadly I bet it would be. Geez, got a g1, g2, star convoy, rid mini Optimus, rid big Optimus, classics, armada, Robotmasters Optimus, kinda includes Robotmasters Victory Leo with the mini Victory Saber. Also rid Nemesis Prime repaint of Hero Optimus. Alternatives Optimus too of course... Also a Robotmasters Optimus Primal. and then I'm sure I left one or two out. Ooh, cool! I always wanted the RM Victory Saber set. I guess I'll have to let my Kabaya Star Convoy stand in until I choose a proper figure! No Optimus?! D: That is like having no Starscream! I had 4 Optimus Prime toys. One of them was a HFTD Optimus prime toy from the ROTF days before DOTM Came along. the recent Optimus toy i have is the AOE Optimus Leader class toy. Not yet in my current collection. It's a hodge-podge of third party figures and Hasbro officials. Haven't found the right Starscream or Optimus yet. You should approach one of those freelance Transformers makers. They did wonders with Motormaster and Predaking (not they names they sold them as, of course). They may be able to make it work.